The picture above is crucially important. This person and Japanese activists like him are the ones who hold the key and will be able to turn the deadlock on the Taiji Cove situation. I think that this seaon 2013-2014 will be different from the last season as Japanese people begin to protest and educate their compatriots. The Fishermen’s Union and interested parties have always played the imperialist card to justify their continued drive hunting by demonising the protestors arguing that the opposition comes from outside of Japan and is an example of imperialists trying to subvert a culture/tradition. They will not be able to take this line when the new wave of protest is coming from within Japan. So to further the cause we need to applaud and support these brave people who come openly to denouce the Taiji drive huint and whaling. Japan is not like the UK. A Japanese lady told me that those individuals who do not tow the country line are hounded and intimidated by the powerful Nationalists so this gentleman pictured above was very courageous and has probably got himself into deep water. People like him are paving and walking the road to progress that will eventually lead to the demise of the atrocities within the Cove. They need our support and the Japanese Government need to know that we are watching and discussing as I maintain that we are the protestors’ protection. 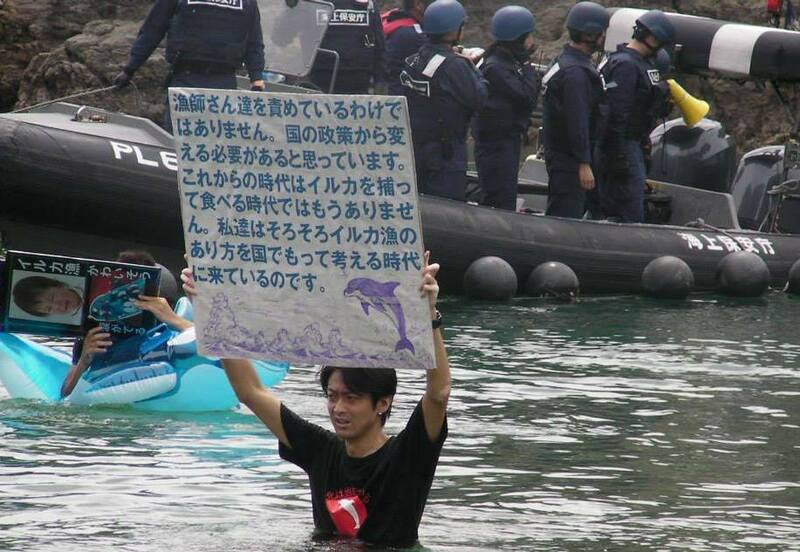 So despite what is happening within the Cove do not reject and denouce all Japanese because you are including the Japanese activists who will make the crucial difference. This entry was posted in Dolphin, Taiji Terror Tales, whales and tagged Dolphin Show, dolphins, Taiji, Taiji Cove and Related Information. Bookmark the permalink.